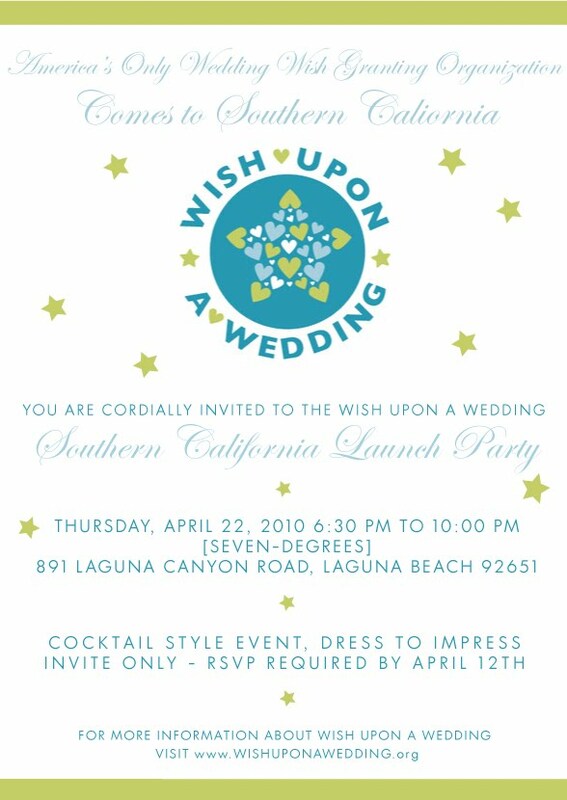 I am so thrilled to announce the launch of the Southern California chapter of Wish Upon a Wedding this April 22! Wish Upon a Wedding,a brand new nonprofit organization dedicated to granting weddings and civil union ceremonies at destinations across the United States to couples facing life-threatening illnesses, will celebrate the launch of their Southern California Chapter on April 22, 2010 at [Seven-Degrees] Laguna Beach from 6:30-10:30pm. To RSVP, please email laevents@wishuponawedding.org. Founded by wedding planner, Liz Guthrie of San Jose Wedding Consultants, with the belief that no couple should ever be denied the chance to marry the one they love,Wish Upon a Wedding is the only organization of its kind in existence today. For more information visit the Southern California Chapter Fan Page, the official Wish Upon aWedding Website, or follow Wish Upon a Wedding on Twitter. hello!!! im in seattle! i love your posts! can you please find some wedding events in seattle?!? !